I just finished my first TPT pack! Last week I bought a TON of clip art from Scrappin Doodles and couldn't wait to make something fun! My goal is to make things for TPT that I will actually use in my classroom. I definitely think this project fits the bill! I made each item in color and black and white, too! The next couple of weeks of school are super crazy for us and I think these activities will be a great way to practice writing, sentence building, and organizing information. Get the literacy pack here! ALSO: The folks over at Blog Hoppin are having a sweet giveaway! 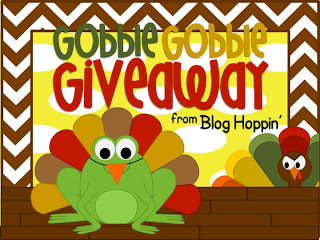 Check it out for your chance to win some sweet Thanksgiving stuff! Christmas Field Trip & Christmas Literacy Pack!